Hey ourWorlders! 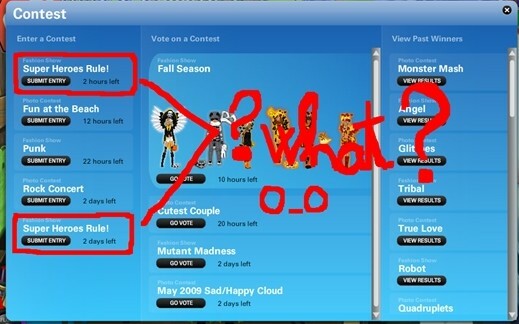 When I tried to enter a contest, I saw a curious thing. There were two contests with the same name. It happens often. I don`t know if it is a bug. You can see for yourself. There were two ‘Dec 2008 frost’ contests and two ‘Super Heroes Rule!’ contests and a lot of others. It’s strange, isn’t it? Are they running out of contest ideas? This entry was posted in Bugs/Glitches, Secrets. Bookmark the permalink. Under the first one it says 2 hours and the other one says 2 days.